Freshly launched in celebration of Earth Day, the new book River Reveal: Photographing the Mississippi in Saint Paul brings the contemporary experience of the river into focus. This photo book and collection of images culminates an 8-month emerging photographer's residency at the river featuring local artists Monica Bryand, Erin D. Carter, and Chris Juhn. Those who spend time with the river know it is the potent, unexpected, and living aspects of the Mississippi that define it and create lasting relationships to it. Last year The Great River Passage initiative established an emerging photographers’ residency enlisting local artists to manifest the character of the river for the greater public. Our ambition was to counter the typical idealized or managed view of the river and by doing so bring the authentic contemporary experience of the Mississippi to people beyond its banks. From 22 submissions, our three photographers were selected based on their diverse backgrounds, high-quality portfolios, and unique strengths and styles that bring together the best in photojournalism and wildlife photography. They have been an exceptional trio to work with and we are delighted to share their artistry with you. What is assembled in the book is a glimpse at their distinct, compelling approach to photographing the Saint Paul stretch of the Mississippi River. Add your photos to the growing collection of Saint Paul Mississippi River images using #STPriver on Facebook, Twitter or Instagram. 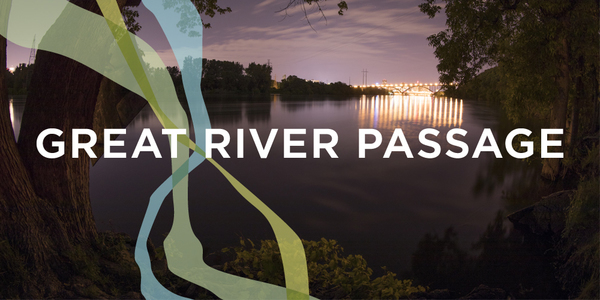 Great River Passage is both the 17 miles of the Mississippi River that flows through and defines Saint Paul and a City-led initiative whose mission is to enhance, better connect to and steward one of the three great rivers of the world and its surrounding natural and built environments. The Saint Paul Parks and Recreation Department is implementing a bold, strategic vision to steward and tap into the potential Saint Paul’s riverfront. By implementing the plan, the city will create places and activities that strengthen existing connections and create new ones along the Mississippi. Questions? Contact Us or visit www.greatriverpassage.org.